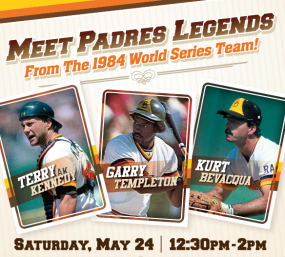 May 22, 2014 (Dehesa)—Visitors to the Sycuan Casino on Saturday, May 24 will have an opportunity to meet San Diego Padres’ 1984 World Series players-- and have a chance to win the grand prize: a road trip for two to Chicago to watch the Padres take on the Cubs. The event takes place Saturday from 12:30 to 2 p.m. Tickets will be distributed starting at 10 a.m. in the casino’s front lobby. The first 200 people are guaranteed to meet the players. A free commemorative signed photo plus Padres baseball caps will also be given away, while supplies last. For a chance to win the road trip to Chicago, swipe your Club Sycuan card at the front lobby promotional kiosk between 10 a.m. and 2 p.m. The drawing will be held at 2 p.m. and you must be present to win. See Club Sycuan for Official Rules. The casino is located in the Dehesa area of El Cajon. For details and directions, visit www.sycuan.com.